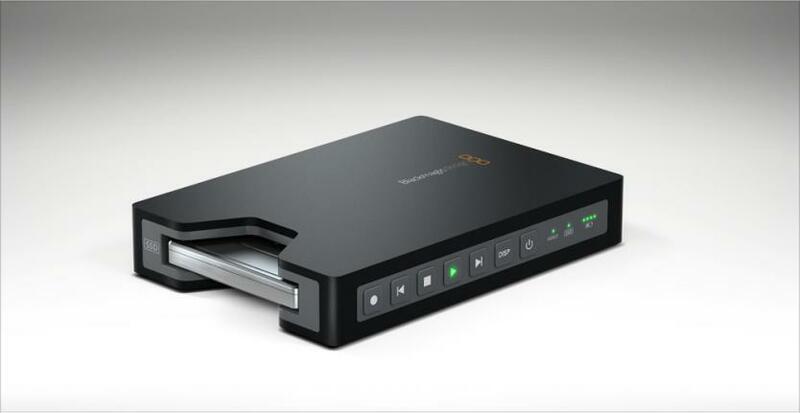 The Blackmagic Design HyperDeck Shuttle 2 SSD Video Recorder records uncompressed 10-bit HD and SD video as QuickTime files from any SDI- or HDMI-enabled camcorder. This updated version of the original HyperDeck Shuttle also records Avid's DNxHD 220x 10-bit codec. The extremely compact recorder accepts a 2.5" SATA solid state drive (sold separately) for data storage. Simply by bypassing the camera's compression, this allows you to get the highest-quality output possible from camcorders that typically record video as highly compressed HDV, AVCHD, or another similar codec. Sometimes, however, capacity is an issue, and HyperDeck Shuttle 2 offers the option of recording high-bit-rate compressed files. For Avid users, it doesn't get much more convenient than capturing 10-bit video as the extremely high-quality DNxHD 220x codec. Ready for the Media Composer timeline immediately, the MXF file type is available for 1080i59.94, 1080p29.97, and 720p59.94 formats. Note! The HDMI output from DSLR cameras such as the Canon 5D/7D and Panasonic GH2 is intended for monitoring only, not for recording. 2.5" SATA SSD drives are sold separately. Off-the-shelf SSDs can be used as long as they are fast enough for uncompressed 10-bit capture (158 megabytes/second is required for 10-bit uncompressed 1920 x 1080 @ 29.97 fps).